Julia grew into a Cat-4 hurricane by 5am last Wednesday (Sept. 15), making it the fourth Category 4 storm to form, and earliest on record that so many large storms have occurred in a single season. The Category 4 storms formed within the shortest time span ever recorded. Julia is the largest hurricane ever to form so far east, Earl the fourth largest so far north. Update: Lisa has now formed – making for the twelfth named storm of the season thus far. how about opening this site? Hurricane Karl peaked at category 3 strength, not category 4. It was Hrricane Igor and Julia that peaked at cat 4 at the same time. Thanks Nick. I\’ve made the correction. This season has also produced the largest ever Hurricane in the Atlantic basin, Hurricane Igor. This September has become the most active on record, joint with 2002 and 2007. 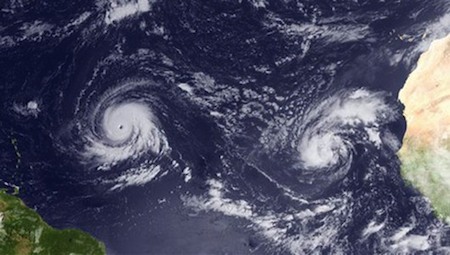 First time since 1926 there were 3 active Hurricanes (Igor, Julia, Karl) on September 15th. Also from August 21st to September 26th there wasn’t a single full day without at least 1 active storm (36 days), the highest period of time since the 2002 season with 45 active days. Wow indeed. Thanks for the information. And not one of them even came close to doing any real damage.